Hello dear rose friends as we fast approach Christmas Eve with only four weeks to go … here’s a novel way to spend your Saturday 3rd December evening and do all your Christmas shopping at one place! 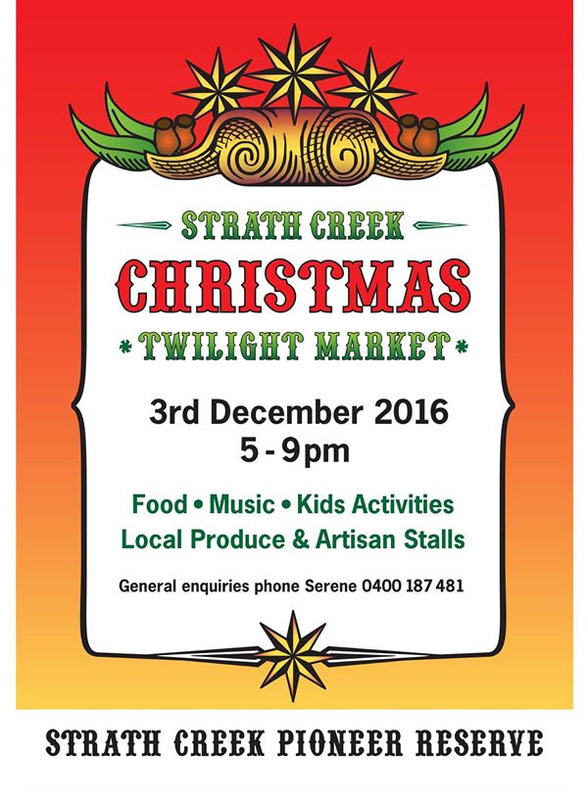 If you can make it, I think this will be a lovely event nestled in the VALLEY OF A THOUSAND HILLS at Strath Creek. 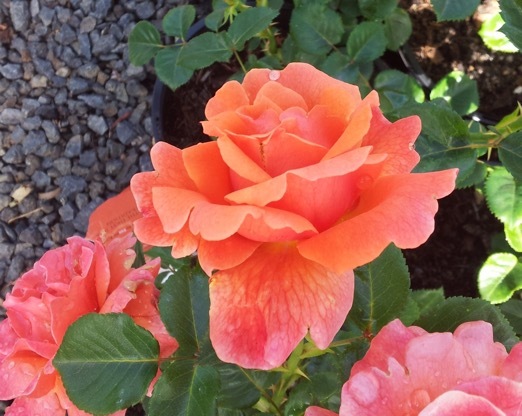 We had a beaut weekend at the State Rose and Garden Show where the State Rose Gardens looked sensational! 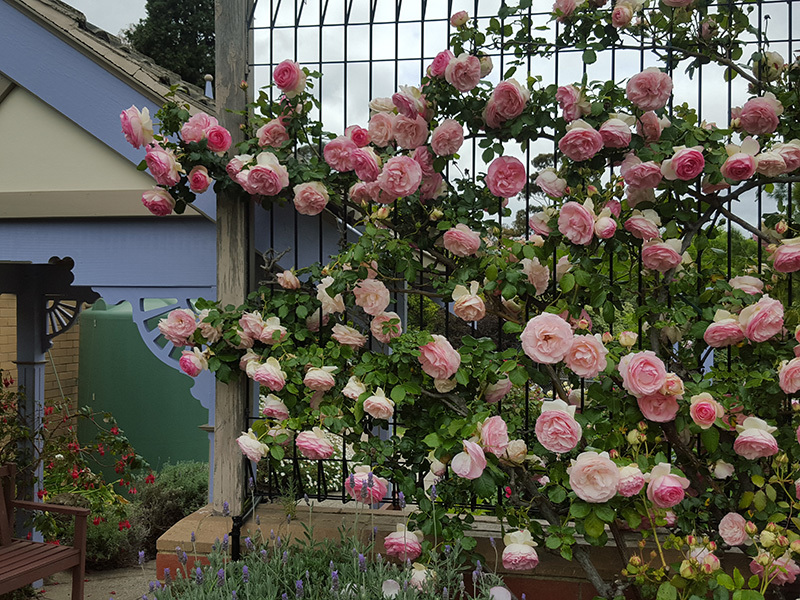 There is no doubt that climbing roses can be an integral part of rose garden design and they’re magnificent at Werribee State Rose Garden – entry to the park is free, there’s lots of car parking close to the gardens – take a picnic and have a lovely family day out surrounded by beautiful rose gardens! 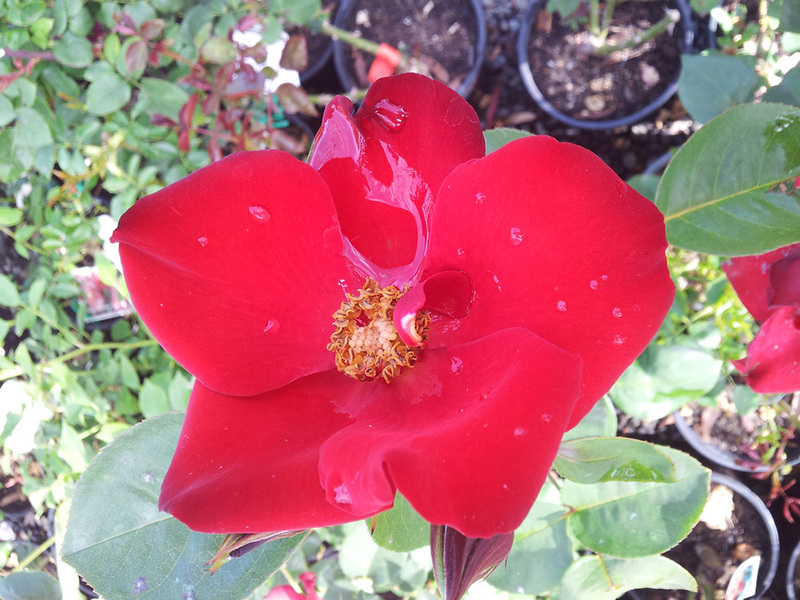 A strong, deep, vibrant red with single flowers about 8 petals on each flower and a boss of golden yellow stamens. The rose is seldom without flowers and stands out like a beacon in the garden. It’s a tough rose and could also make a lovely hedge 2-3 metres in height. 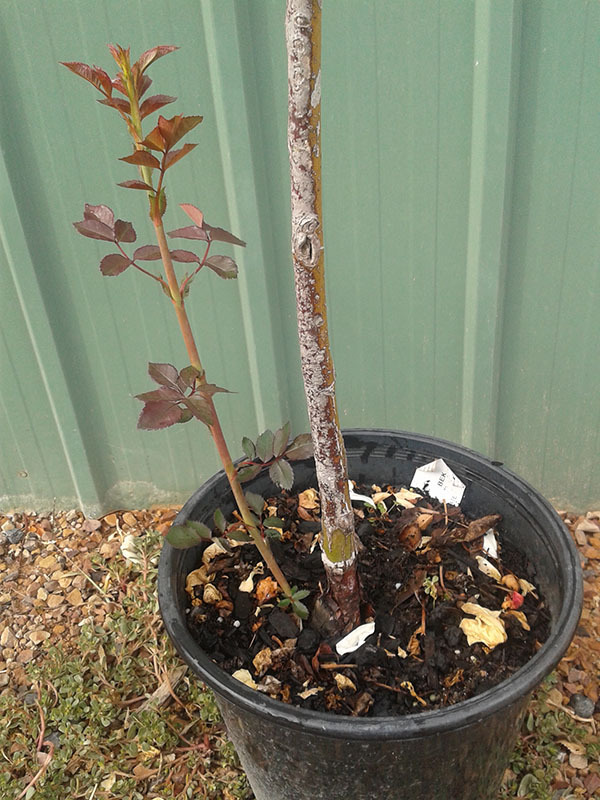 The foliage is very clean, deep green and extremely healthy – a very highly recommended rose. A vigorous, lightly wooded plant that will easily cover 2.5-3 metres. Lightly scented clusters of copper yellow flowers and deep green, shiny, disease resistant foliage. Prune in a conventional way or hedge to form a blanket of growth and flowers over the entire growing surface. CREPUSCULE is so versatile and also makes an excellent weeping specimen. 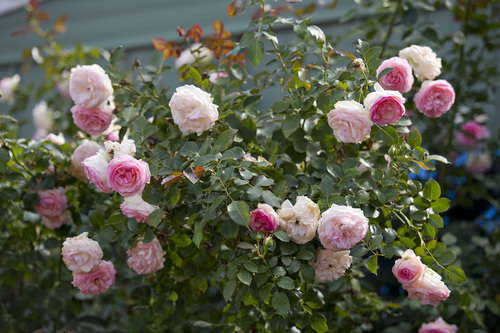 Trim constantly and you will have flowers continually throughout the season – a truly brilliant rose! Flowers are two-toned creamy white centres with pale pink brushed edges on 40 plus petals in each lovely flower! The leaves are large and glossy. 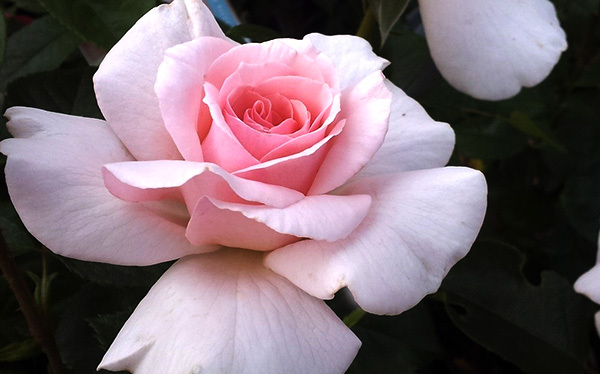 This is a truly stunning rose and makes an impact in full bloom – one of our best-selling roses! Q. What do you call a wood pecker without a beak? A. A head banger! 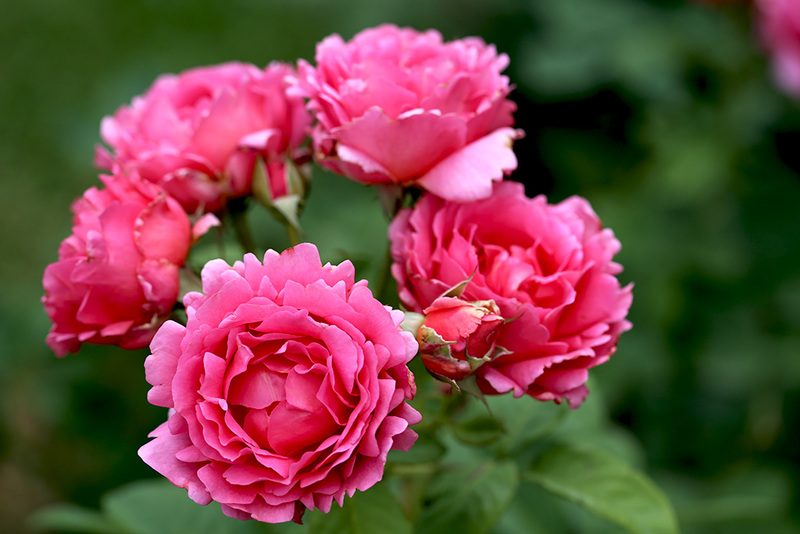 Whilst flowering or just after a good flush, refresh the plants with a boost of fertilizer, trim the rose stems back around 12cms and your roses will continue to retain healthy foliage which in turn means you’ll have lots of flowers continually too! Use an organic fertilizer like cow manure, Sudden Impact for Roses or Better Grow organic rose food. If you come to visit us here at Clonbinane, take a 25kg bag of Complete Organic Fertilizer (COF) as it is great to use on ALL plants in your garden (except Natives of course). Also apply seaweed solution over the leaves to maintain healthy foliage, boost flowering and make the plant a lot tougher – seaweed will give you 30% more flowers so use it at least once a month. Q. What do you get when you walk under a cow? A. A pat on the head. After 10 years of development, SLASHER is now registered and will be more readily available – we know this product works and are so pleased that it is Registered Organic for use in organic farms and gardens! 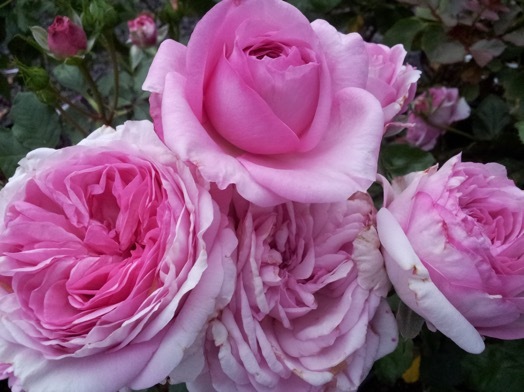 Have a beaut week in your garden – keep emailing your queries about growing roses as we are compiling a FAQ’s folder which will be available soon at www.allaboutroses.com.au where past issues of this Rose Rambler are stored for you to access easily. 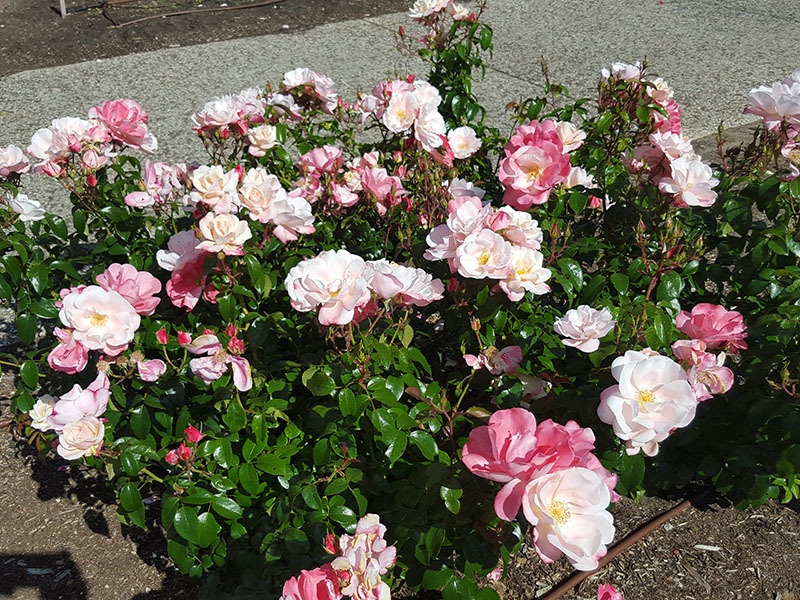 Hello dear rose friends as we gear up to show-off our beautifully healthy, flowering potted roses at the FREE Wyndham City Event – STATE ROSE AND GARDEN SHOW this Saturday 19th and Sunday 20th from 10am – 4pm … BE THERE! Diana will be speaking at 3.00pm SATURDAY, 19TH … see you there! We finally had to have lovely sunny days and I’m so pleased that this weekend promises to be beautiful weather for our outdoor event. Q. How do you stop a giant from smelling? A. Cut off his nose! We’ve had a really busy week so we won’t be giving you a lot of info in this Rose Rambler but I want to show you our ‘new’ compost heap. 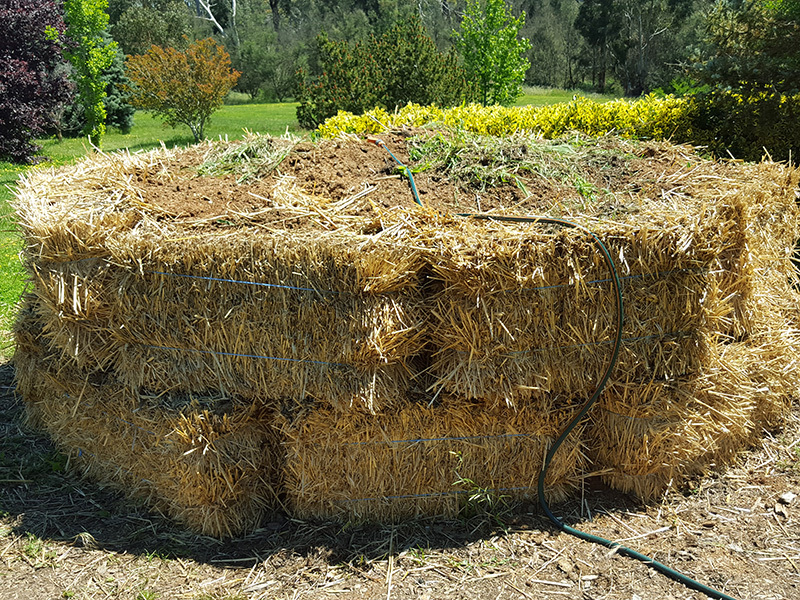 I had to create this to ‘house’ the wheat straw weeds we had pulled from all the garden beds over past weeks – it would have been such a waste to put them on a bonfire. This compost heap is approximately 3 metres around, created using 18 straw bales and with adequate watering, Graham says we’ll be able to remove well-rotted compost in about 8 weeks … nice! I really like the look of this – very organised and tidy on our roundabout driveway. 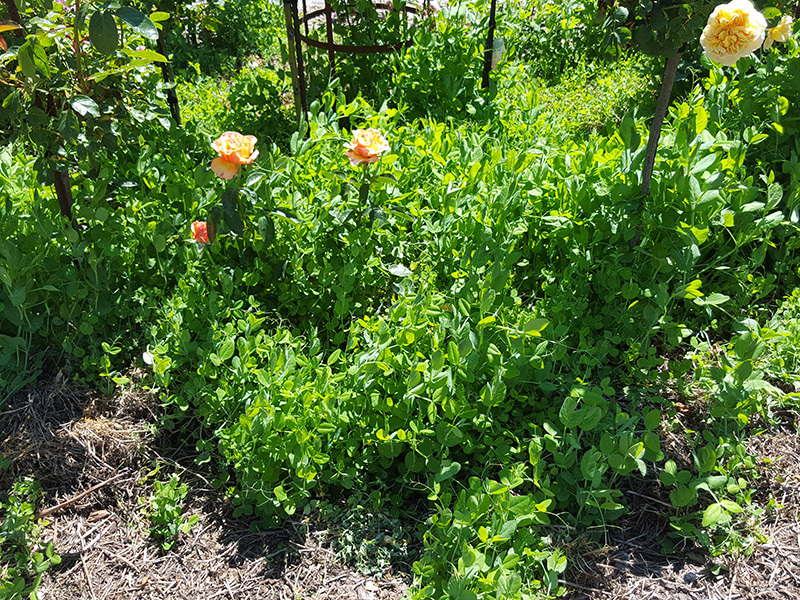 Here is an updated photo of how the pea straw continued to grow – Tova used a brush-cutter to trim some of it but it just keeps growing – I guess one day soon I’ll be down on hands and knees pulling it up! 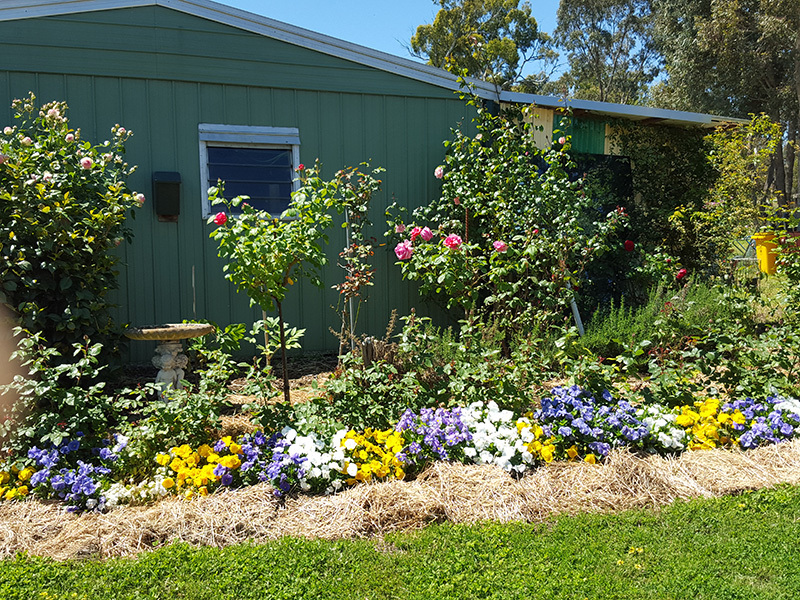 On the other hand, here’s neat and tidy mulch application – lucerne biscuits along the border of the garden with newspaper underneath (to slow down creeping weeds) and pulled apart and fluffed-up lucerne in the garden around the roses … ideal mulching! 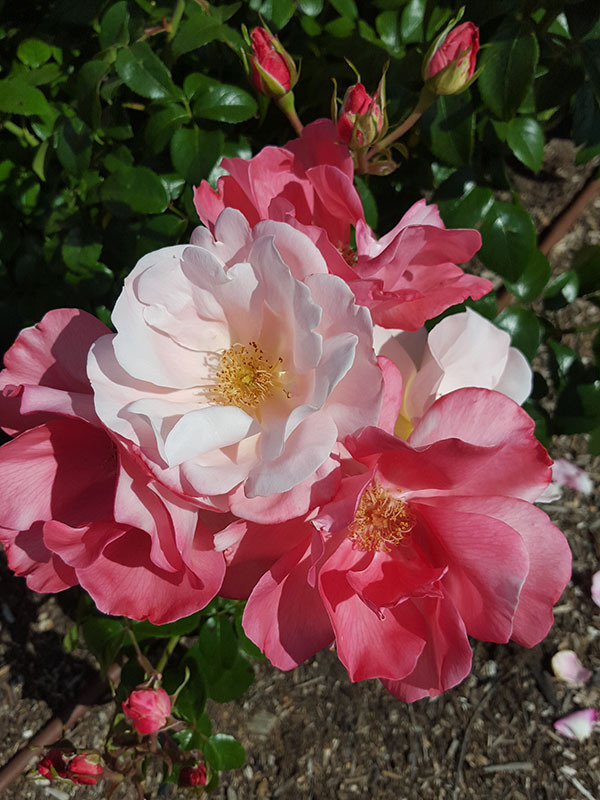 Here are some random pics of roses which are flowering in pots around the nursery … come and see them at Werribee this weekend or call in for a visit at Clonbinane where Graham and Tova will be – the gardens are delightful here now! 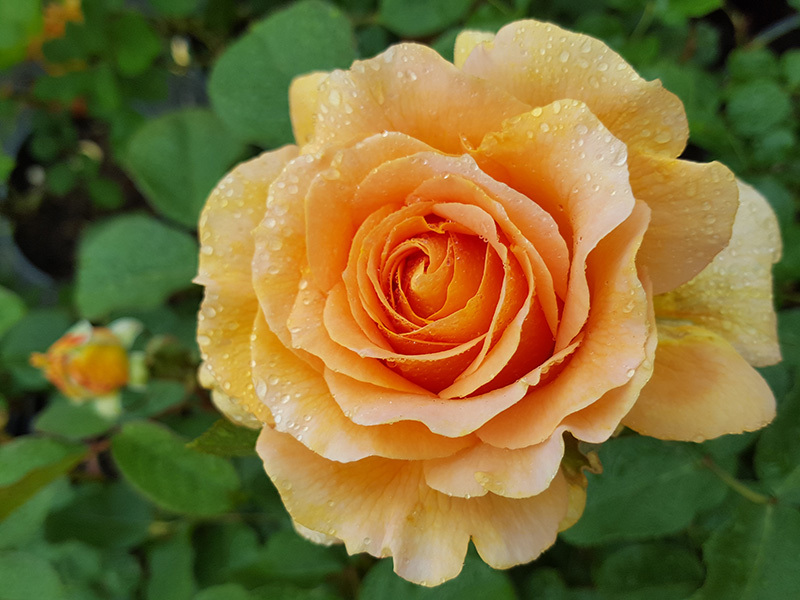 Deep warm apricot high-centred buds which open to fully reveal the eye-catching bronze which finishes a coppery pink, generous clusters and lovely spicy scent. Mother’s Love has beautifully long pointed buds of the palest pink with slightly deeper pink centres which may fade in the very hot sun. A worthy climbing rose to plant because it is such a spectacular performer with flowers from the earliest Spring until well into the Winter. 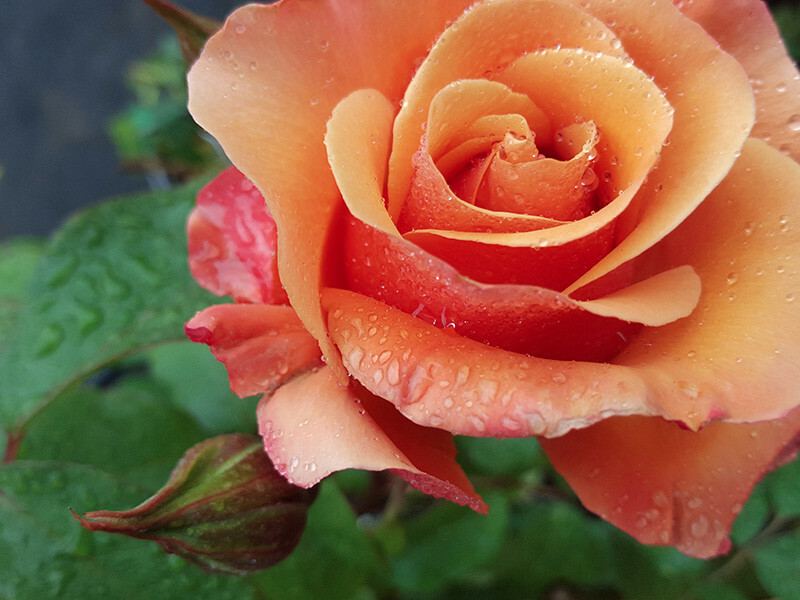 Enjoy the last two weeks of spring 2016 and if you need advice about any issues with your roses, please email me: info@rosesalesonline.com.au which is sometimes better than trying to get us on very busy phone lines … truly sorry for the frustration but I can only answer one phone at a time! Whoo, whoo, we’re finally flowering in most areas of the gardens and definitely the potted roses are looking stunning! It’s been extremely cold with frosts very late – just last weekend, we were pruning frost-damaged foliage on our roses – they’ll recover but will probably only flower for Christmas this year! 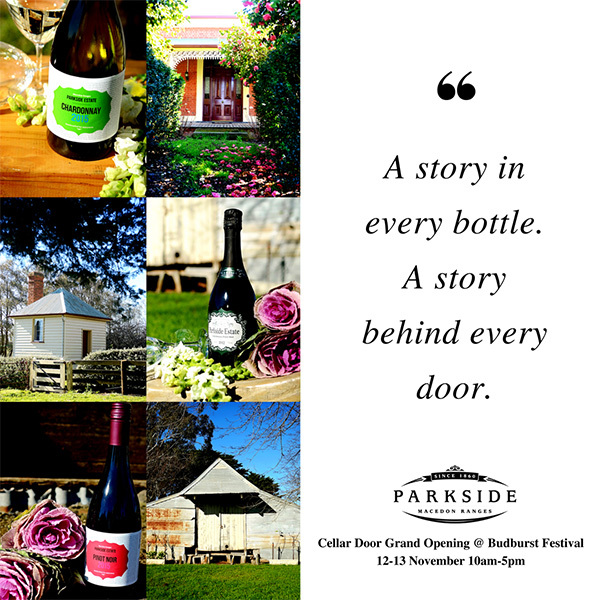 Budburst Festival is on in the Macedon Ranges this weekend – of particular note we recommend you call at PARKSIDE WINERY at 308 Parks Road, Lancefield for the official opening of their Cellar Door for budburst weekend (www.budburst.com). At Parkside Winery (www.parksideestate.com.au) you’ll be treated to taste magnificent wines of our region served in the historical barn which our son Eric has enjoyed restoring during this past cold, wet winter – every bluestone laid with love as only Eric would … a mammoth task he said and so rewarding to be part of the history! You MUST take a look … mention to Darryl that the timber cobble floor would look much better finished in blackwood and he’ll know exactly who sent you … enjoy! Pictures in last week’s R/R are the rose which I hope is released in 2017 because it was so delightful and I fell in love with it! Sorry for the confusion and thank you to those who responded with such enthusiasm. FALLING IN LOVE and THE CHILDREN’S ROSE and they’re growing wonderfully in the garden. It’s surprising how much they’ve grown in such a short time and we’ve even had a couple of roses. I wanted speak to you about the other roses your two have come to live with. They belonged to my grandfather and I transplanted them about 3 years ago from his garden to mine before we had to sell the family home. I know that goes against the gardening rules as the nurseries all told me in Sydney that roses can’t be moved but I moved these successfully. I only lost one rose following the move with 7 of them now living in my garden and doing very well about 3 years on. These roses are quite old and one my mother tells me is over 100 years old and it has now lived in 3 gardens, as my grandfather moved it in the 1970’s from my great grandmother’s place to his. My response: Hello Susan … it always staggers me that nursery personnel suggest it is impossible to shift / re-locate old roses! Of course, there can and might be fatalities but one should always TRY no matter what the weather or season! As long as the gardener puts their head and heart into the task, it will generally be successful! Seems you have been successful in the relocation – AWESOME! Now you wish to propagate and share plants of those precious old roses so you need to send me some canes that we can have ‘contract budded’ this budding season from Nov-Jan … please don’t wait but send wood sooner rather than later!!! This wood is around pencil-thick and there was a flower or bunch of flowers at the end of the cane which are now finished. This part you’re going to send me is really the length of cane which you would normally cut back and throw away! It is important for ALL to note that any CONTRACT BUDDING requires no less than 5 plants per variety to be budded so you will have to purchase those 5 plants the following winter. 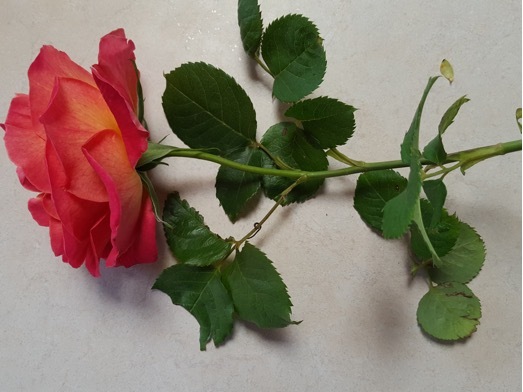 Contract Budded Roses cost $32.50 per plant and will be available no earlier than late July/August; bare-rooted plants will be supplied with a hand-written identification tag. We will not take responsibility for failure of any variety to bud successfully – you will only be charged for plants supplied in winter. Please don’t race out into your garden and take budwood from all the ‘old’ roses in your garden as lots of old roses are still in production and we are EXCLUSIVELY offering this service to customers who wish to retain rose varieties in perpetuity – varieties which are almost certainly not in production today and which are as significant as those in Susan’s story above. Our roses, when we experience them with ALL our senses, can make our soul sing! TOUCH – feel the texture of rose petals, so soft – wiggle your toes, feel the ground or ‘Mother Earth’. Experiencing all our senses to connect with the beauty of nature, keeps us vibrantly healthy and alive. Q. Why did the lizard cross the road? A. To see his flat mate! Slugs and snails are very predominant in our gardens due to unprecedented rains so I urge you to protect your plants by using an Australian product called ERADICATE which is safe to use around your pets and birds! Obviously use any snail bait wisely – do not place pellets in heaps but broadcast approximately 70 pellets per square metre so they break down readily as soil/plant nutrient and are not easily accessible or attractive to your pets or birds. Q. Why did the orange stop in the middle of the road? A. Because it ran out of juice! 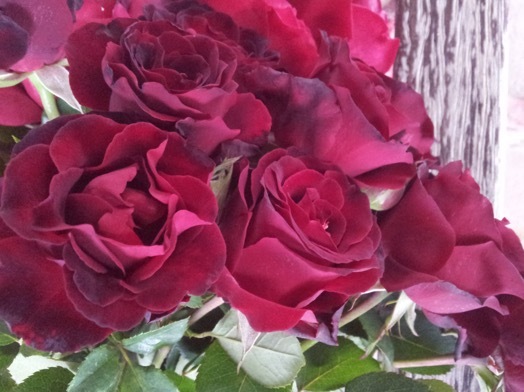 MOST SPECTACULAR ROSES IN THE NURSERY TODAY..
Darkest black red, most gorgeous waved petal form, longest-lasting flower on the bush … what more could one ask for? Fragrance perhaps? It missed out there but ticks every other box for a ‘must-have’ rose! If you are ever looking for back-issues of this Rose Rambler, you could spend days trawling through www.allaboutroses.com.au where you’ll find no less than four years of publications along with an encyclopaedia of roses which I plan to update in coming months. 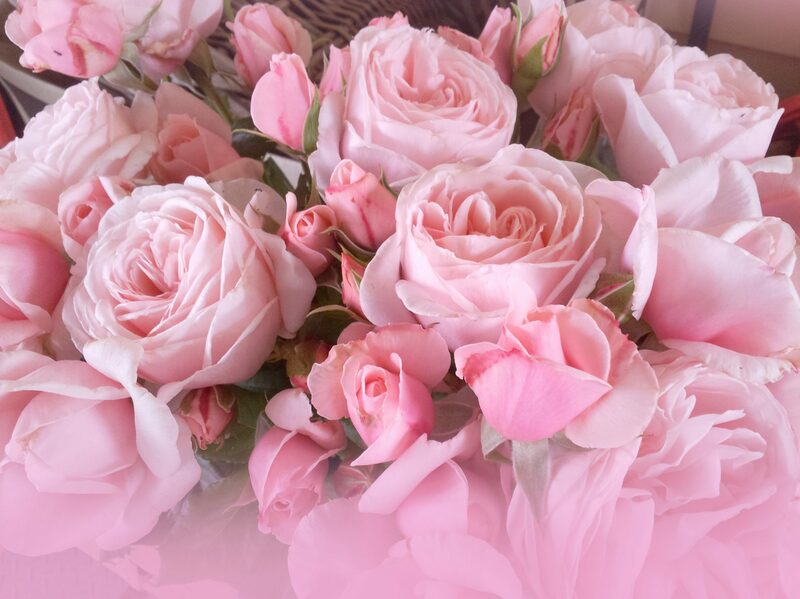 Be sure to put www.allaboutroses.com.au in your favourites so that when you need a quietly relaxing place to visit with roses this lovely website is right there – ask questions, get information and see lovely rose photos. Hello dear rose friends … so, did you back the Melbourne Cup winner? 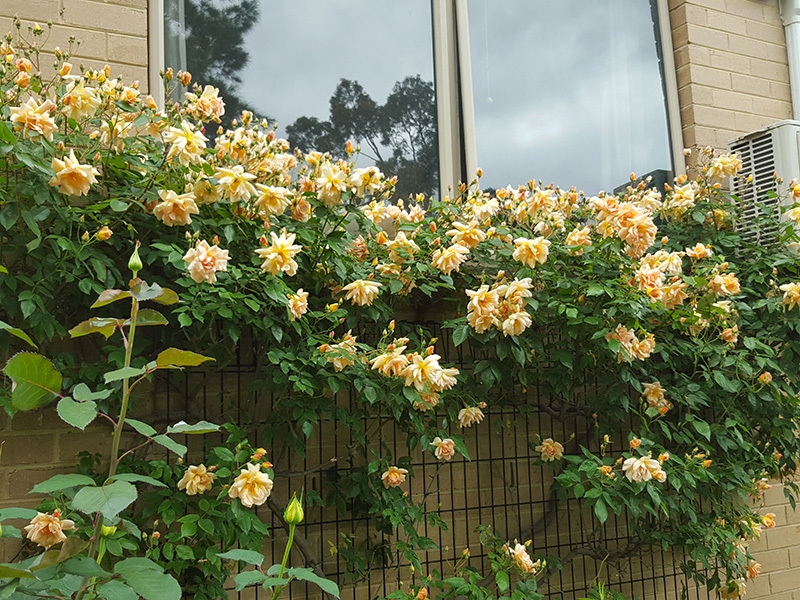 Weren’t the roses spectacular despite the abysmally cold, wet, wintery weather that Terry Freeman and his team had to contend with to get them so beautiful … ah, Melbourne, no wonder it wins as the ‘most liveable city’! 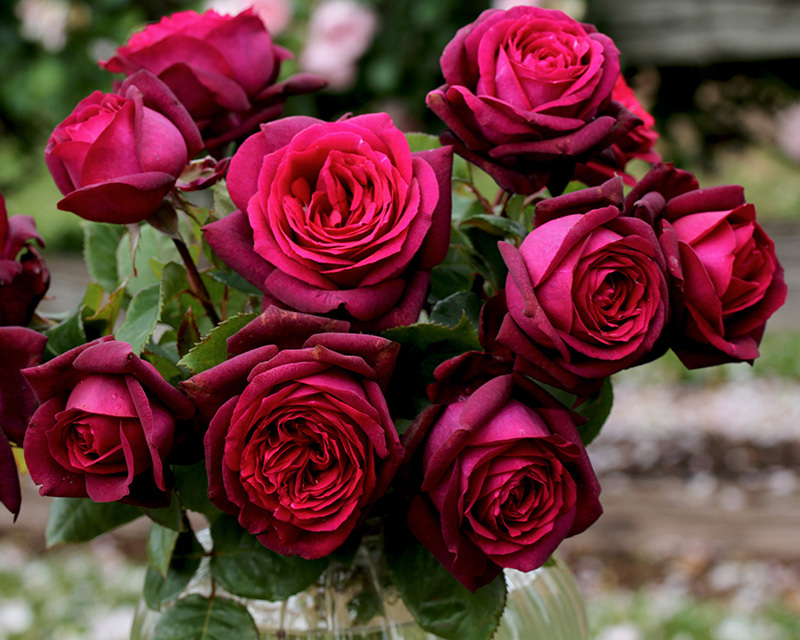 Congratulations to the rose breeders of the world who have been rewarded after two years of assessment at the Australian Rose Trial Grounds in Adelaide … this year, DARK DESIRE won MOST HIGHLY FRAGRANT ROSE – such a magnificent rose which you would love in your garden … Pop it on your ‘wish-list’ for 2017. 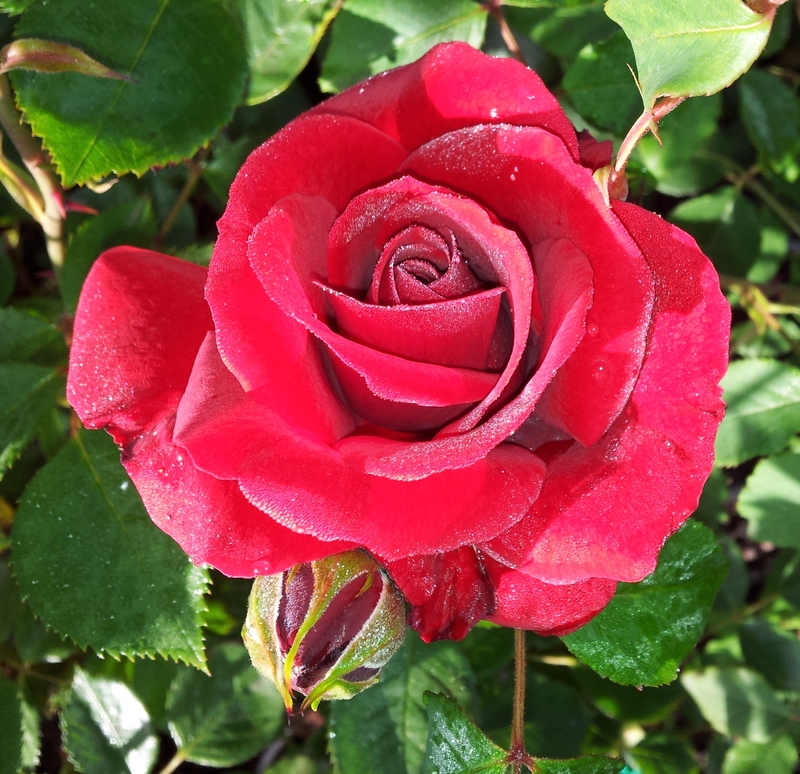 The rose which Diana has entered in the Rose Trials looked stunning and is performing very well as it enters its second year of assessment … should we name it JUST LOVELY? and the rose which Diana loved most – this rose might be released 2017 ??? 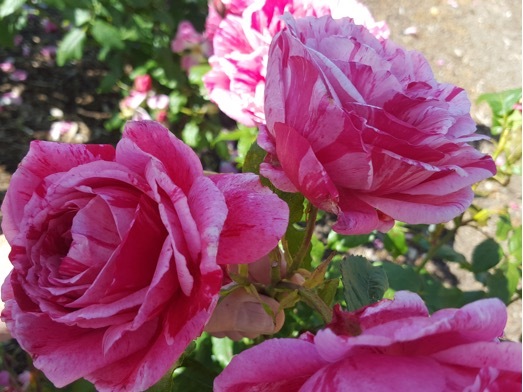 Please, if you have an opportunity when visiting Adelaide, pop into the Botanical Gardens where the Australian Rose Trial Grounds are situated and you’ll be delighted by the roses in the gardens there. Q. What dog keeps the best time? A. A watch dog – of course! Easy one. 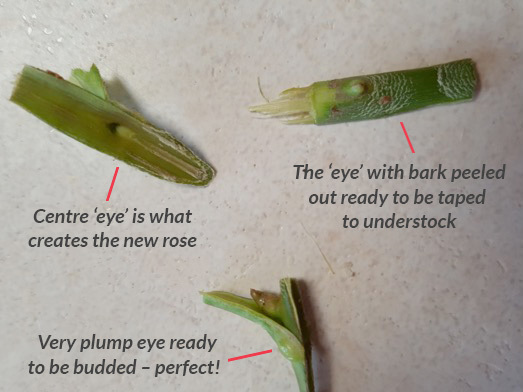 It is so important during this amazingly strange weather to be diligent, observe what weather patterns permit application of the organic rose management program to ensure your roses retain healthy foliage which in turn will promote lots of beautiful blooms throughout the coming flowering season! Fertilize NOW – then again in six weeks because heavy rain will have leached nutrients from the soil. There is a huge difference between a WATER SHOOT and UNDERSTOCK … easy to see in this pic of a suckering standard rose. “ …. get down on your hands and knees at the base of the plant, scrape back some soil near the sucker and see where it’s growing from. Usually it will be attached to the understock and might be way down deep or could be quite obvious close to the surface.Put your garden gloves on … once you’ve revealed the source of the understock branch, grab hold of it and yank it really hard and fast – I liken it to when the kids had a loose tooth and I would ask them if I could take a look and wobble it maybe. Quick yank, tooth gone and kid wondering what the heck happened but excited about the tooth fairy coming that night. When you’ve yanked the sucker away from the understock it is very important to check if there is a nice rounded end on what you pulled away. If you can see and ‘eye’ which could be compared to a corn on your toe, then you have been successful in removing the sucker. 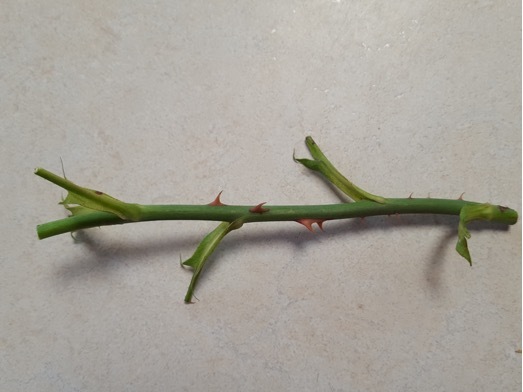 NEVER, EVER cut suckers at ground level – as we all know, roses love to be pruned so cutting suckers encourages them to grow even more – they must be removed! Q. Where do baby monsters go when their parents are at work? A. The day scare centre! Hiya Diana, My roses arrived on Friday, in the ground Saturday and looking a million dollars today, Tuesday! Very hard to grow roses in a sub-tropical area but I have been for 30 years and with persistence I have success! Thank you for your great service, take care!